One of Doctor Corto’s duties is preparing the Severance, the salve that marks outcasts as Other, forever severed from the village. Once a skilled host for his ghost, Corto is old and careless. The latest batch of Severance was intended for the reprobate Sethr. Handry stumbles onto the untended vat. The amount is small and immediately cleaned off. This spares Handry the full, dramatic effect Sethr suffers. Sethr is immediately marked as Outsider. Handry is marked as something not quite of Aro, not different enough to drive away. Sethr immediately loses any ability to digest regular food. Handry only loses much of his ability to digest food. Sethr dies miserably soon after being cast out. Handry, on the other hand, endures three years as a grudgingly tolerated, half-starved reminder of Corto’s ineptitude. Progression of decontamination irreversible. (…) Recommend expulsion. Rather than subject Handry to full Severance, Melory resists her ghost long enough for Handry to flee. He is an exile but unlike most exiles, he can survive in the wild indefinitely. It’s a hand-to-mouth existence until he meets fellow exile Sharskin. Sharskin is building a community of exiles out in the wilderness, in a vast, peculiar, house. Except the house is no house, although it was once a home. It is the very vessel that transported humans to their new, alien homeland. It has taught Sharskin much, enough that he is convinced that he can change the world forever. To do that, Sharskin needs a special person. He needs Melory. Handry’s world was settled by people who seem to have gone out of their way to set up a system that is needlessly cruel. Severance, for example, has the same effect on humans as oleic acid has on ants; it compels the humans to drive away the marked person. Severance also strips the victim of the (presumable artificial at one point) antihistaminic biome that makes it possible for humans to metabolize the local life forms. Without the biome, they suffer allergic reactions to the local proteins and die in pain. Fairly quickly, but not quickly enough. Hitting the outcasts in the head with a heavy rock would be less cruel. Presumably the intent was to motivate obedience. Humans do like their gratuitously cruel social arrangements. Some have lasted for millennia. This one has survived for five centuries before it stumbles. 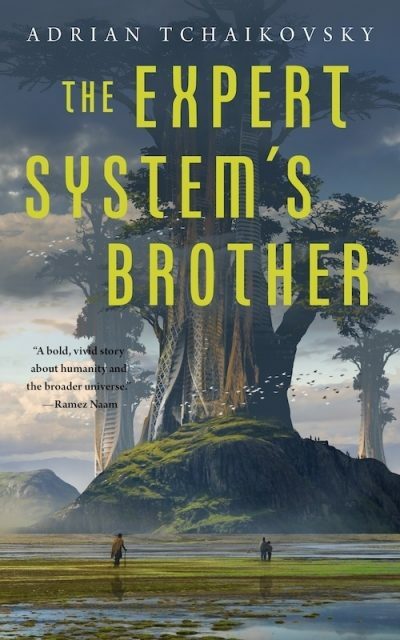 The world of The Expert System’s Brother is a cousin of the worlds featured in Brian M. Stableford’s Daedalus series. The moral of both settings: “settling alien worlds, life-bearing worlds whose organisms were the product of billions of years of evolution unrelated to ours save for being subject to the same physical laws, is likely to be difficult.” Unlike the unfortunate colonists in the Daedalus stories, Tchaikovsky’s characters at least had some biochemical tools to cope with the situation. The set-up reminded me of the Steerswoman series, which also features a human community surrounded by a biochemically incompatible alien ecosystem. I was also reminded of (this is weird, but bear with me) the old TV series Columbo. There’s a mystery, one about which informed readers will be able to make educated guesses, while the less-informed protagonist struggles to make sense of it all. I liked the worldbuilding, but found the characters thin. In part this must be due to the format: novellas force brevity. Still, even the just-enough-to-flesh-out-the story characters were interesting enough to keep me reading. Will there be sequels? I’d like to see if Handry and Melory can reform the system now that they know how it really works. The Expert System’s Brother is available here (Amazon) and here (Chapters-Indigo).